In a small bowl, whisk together soy sauce, fish sauce, rice wine vinegar, brown sugar and sesame oil. Vigorously whisk in corn starch until incorporated. Add a pinch of crushed red pepper flakes. Heat canola or grapeseed oil in a large wok or skillet to medium-high heat. Add chicken breast and season with salt and pepper. Cook for about 4-5 minutes, stirring frequently, until browned. Add broccoli and stir-fry vegetables and cook another 3-4 minutes, until just slightly tender. Add sauce and cook, stirring constantly, until sauce has thickened, about 2 minutes. 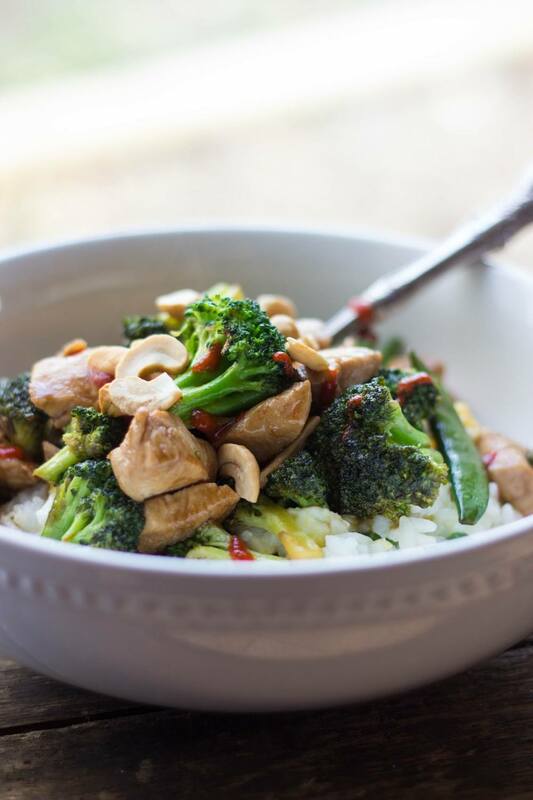 Serve stir fry over cooked rice or quinoa and garnish with cashews/peanuts and Sriracha.